The 1 oz Silver Athenian Owl Coin features a unique stackable detail and a reverse design that’s based on the coinage of Ancient Greece. It’s also the cheapest 1oz premium Silver Coin available today and a great buy for investors and silver stackers. The Niue Athenian Owl 1 oz Silver Bullion Coin is inspired by the ‘Tetradrachm’, an Ancient Greek coin with a face value of four drachmae. Struck in honour of Athena, the Greek Tetradrachm coin featured an image of the goddess in its obverse and an owl, the official polis of Athens complete with olive branch and crescent moon, on its reverse. The owl is a symbol of truth and wisdom and, per ancient mythology, sat on Athena’s ‘blind side’ to enable her to see the whole truth. The coin was in wide circulation between 510 to 38 BC and is the best-known of all ancient coins. Early Owls were struck from Silver from various locations, including Laurium near Athens. The Ancient Greek Tetradrachm contained 17.2 g of silver, while 2017 New Zealand Athenian Owl Coins contain one Troy ounce (31.103 g) of .999 pure Silver. The 2017 1 oz Silver Athenian Owl is an affordable way to add silver to your portfolio and represents exceptional value. Beautiful owl, crescent moon, and olive branch design. Owl’s eyes feature reflective mirror finish to signify wisdom. Add the modern interpretation of the Ancient Greek Tetradrachm to your collection now. 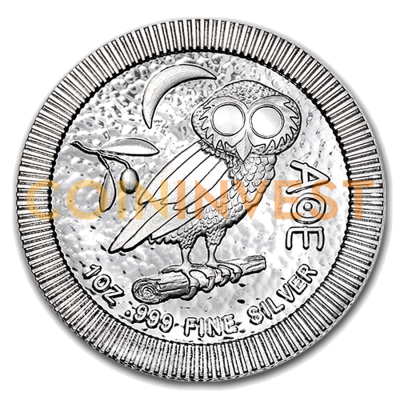 Buy the 2017 1 oz Athenian Silver Owl in multiples of 20, 100, and 500 for Fast Shipping with coininvest.com. An excellent product, great value and a beautiful tribute to the Classical civilisation. Interesting design,very pleased by shop and delivery.